These days, everyone wants to grow and develop…the question is—how do you engage in that growth without burning yourself out? Executive business coach and world champion martial artist Doug Autenrieth doesn’t provide a pre-packaged answer; instead, he offers an interactive roadmap to help you find your own way. 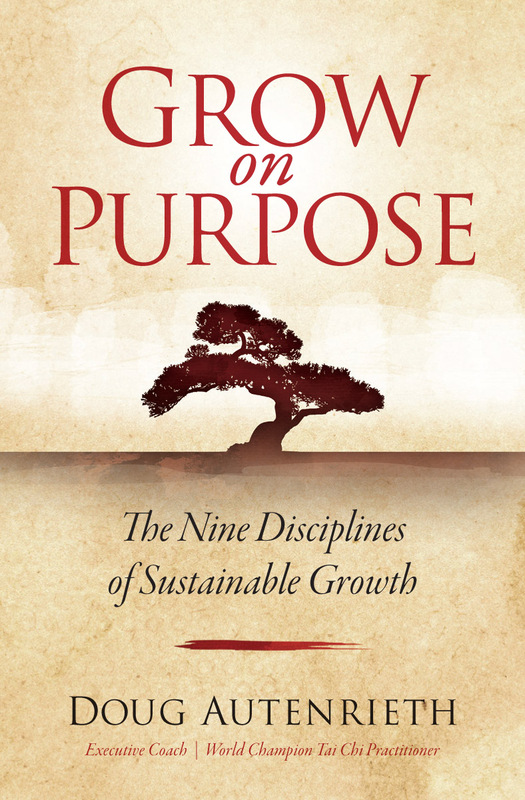 Grow on Purpose: The Nine Disciplines of Sustainable Growth is one of those books that you read over and over again not just for its wisdom but for its masterful way of getting you to find your own personal answers. The book will take you along the path of nine powerful disciplines that, when practiced, will help you grow and develop not just today and tomorrow, but over the long-term. Living, Learning, Planning, Practicing, Restoring, Attracting, Loving, Creating, and Centering. It’s that simple. Or it’s that hard. As Autenrieth tells us, there’s no delegation when it comes to personal development; this particular journey is all about you. That being said, the book has a way of easing the process. Each chunk of wisdom offered is presented in a one- or two-page passage that reads like the most enjoyable poetry you’ve ever read and makes you wonder if there wasn’t a touch of divine inspiration from the Eastern masters themselves. Questions also get asked along the way—in individual passages as well as end-of-chapter discovery questions—so that while batteries are not included, self-reflection is. Choose great teachers and listen. Have a bias for action. Make the shift from consumer to creator. These are just a few of the book’s principles to play with. Want to learn more? Drop us an email to preorder the book at info@style-matters.com or come visit our booth at CAM San Antonio (May 17-19) for a free signed preview copy (while supplies last). 2 Comments on "StyleMatters Presents: Grow on Purpose"
Thanks for your comment, Howard. Keep the book dreams alive!